Joe Miller shares his take on Spanish tapas. Lunch Mon.-Fri., Dinner nigthly, Brunch Sat.-Sun. Open late Fri.-Sat. until 12 a.m.
: Chef Joe Miller of Joe's restaurant in Venice (since closed) was so inspired by the tapas restaurants he had visited during trips to Spain that he decided to open his own back home. He even adheres to the Spanish tradition of discarding napkins and toothpicks on the floor. So here on Santa Monica Boulevard, a stone's throw from the Pacific Ocean, you will find authentic and rustic tapas (stored in a refrigerated window) paired with wines and beers, all from Spain, in a very friendly and lively atmosphere. 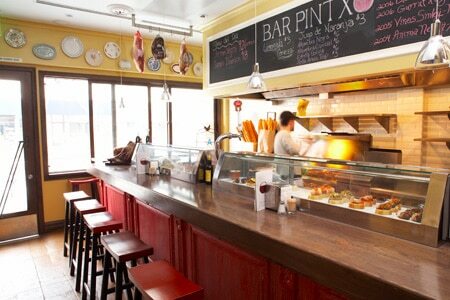 Bar Pintxo (PEEN-cho) is small, and does not take reservations, so be prepared to wait, especially on weekend nights. Whether you are sitting at the bar or at a table, you will not miss the constant action going on in the open kitchen. Start with manchego cheese topped with quince rolled in Marcona almond or mussels in escabèche. The “jamón Ibérico pata negra” aged for 24 months is a delicacy (priced at $20), and the gazpacho is as good as it gets. Continue with the shrimp served with garlic and parsley sauce, and the exemplary croquetas de pollo. There is, of course, paella, available in several variations. Finish with flan, which changes flavors frequently --- the evening we went it was a delicious combination of lemon and rosemary. In case you are wondering what “Pintxo" means: it is the equivalent of Spanish tapas in the Basque culture.